Open or closed, versatile Multi-stack sliding doors are the life of the party. Like a wall of windows these full panel glass doors offer sweeping outdoor views and superb natural light. And when its time to throw open the doors, the panels slide neatly away behind each other for entertaining on a grand scale. A variety of panel widths, mean Multi-stack doors can be fitted in large or smaller rooms. And these panel doors can be made to open to the left, right or the middle. Security locks and handles are provided as standard. 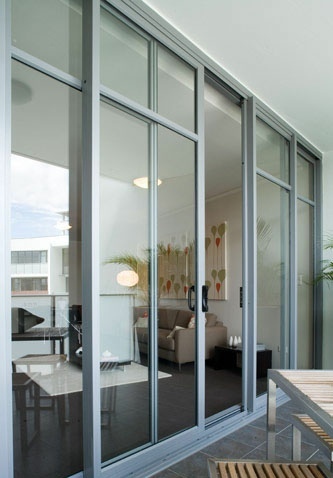 Our sliding door is an accomplished and stylish residential sliding door solution. Designed with quality and functionality in mind, it features curved interlocks and high quality roller hardware to be one of the smoothest operating sliding doors on the market. Its sturdy 92mm aluminium frame also accommodates integrated insect and security screening options. For enhanced thermal performance, optional glazing adaptors can be used to incorporate double glazing . A full range of top light and side light configurations further expand design possibilities. Capable of 3 & 6 panel multi-stack configurations, our sliding door suite can cater for a wide range of residential applications. As well as having a 6 panel corner door option. Our options allow the inclusion and the addition of a fly screen or security door, a common key for sliding and security doors and a wide choice of fashionable powder coat and anodised aluminium finishes. A range of sill options available for increased structural, water performance and design flexibility.